This review was written by Jon Tucker, a student at our partner, Saint Petersburg College. The merging of "Tower Defense" and "VR" is what Siege Hammer aims to accomplish, but does it fall short of its goals? Simple game mechanics, which are easy to grasp, with vibrant and aesthetically pleasing graphics and environments. Decent sound quality and effects and easy to navigate UI and menus. Player movement is disorienting, and seemingly unnecessary, as players can see the whole of the level from any angle. One type of enemy provides no additional challenge as game progresses, they just get more health. This makes for repetitive gameplay. Limited turret placement/variations during early stages of levels. This can be a strategic disadvantage during the last levels and makes the gameplay even MORE repetitive. Counter-intuitive gameplay. Even though players wield a hammer, it instead functions more like a gun as it is not swung, but 'thrown'. Lack of in-game music. A first-person VR tower defense game is something that I believe has a lot of potential if the game utilizes all its elements correctly, which is something that Siege Hammer does not do. The game has all the makings of a great VR tower defense, but is lacking in enemy design, challenge, and variety. All in all, it's a solid tower defense with a neat first person shooter twist, but the game is just too dull and repetitive at the moment. I would only play this if I had very little else to do. Siege Hammer is just too short to be considered worth its current price ( $15 at the time of writing this review). The whole of the story is compressed into a single cut scene. Which, to my knowledge, isn't even voice acted. The story was itself isn't very memorable, and sounds like it could have been thought up in a minute by any amateur game developer. Somewhat slow and repetitive tower defense. Gameplay mechanics are slightly counter-intuitive to the theme of the game. The hammer, on which the theme of the game is based, acts more like a gun or projectile than a tool. Turrets are built by simply pointing and clicking, rather than swinging your hammer to build and upgrade them, which might have added some character to the game. Menus are stylized creatively, and the player HUD is minimal but efficient. The number of Wisps the player has in their possession is indicated in the hammer itself, which is a nice touch and further adds to the immersion. One thing I disliked is that the indicator of your hammer's cool-down timer is a particle which is barely visible. I found myself forgetting to attack because I wasn't sure that I was able to. While lacking originality and variation, the environments are aesthetically pleasing. The environment design ranges from three generic video game settings: Lush grassy forest area, snowy mountain, and a volcano level. Nothing too impressive, but I've seen worse from indie titles. Vibrant colors and slightly cartoony theme makes the game easy to look at. Particles glitch out occasionally, which is somewhat nauseating in a VR game, but it doesn't happen too often. A distinct lack of music and Voice Acting makes this somewhat of a quiet game. Effort was put into the sound effects though. The ambient sound of the levels added some immersion within the VR headset, and using the hammer resulted in a very satisfying thunder sound effect. Again, standard tower defense upgrading system doesn't bring anything new to the table, but does its job efficiently. 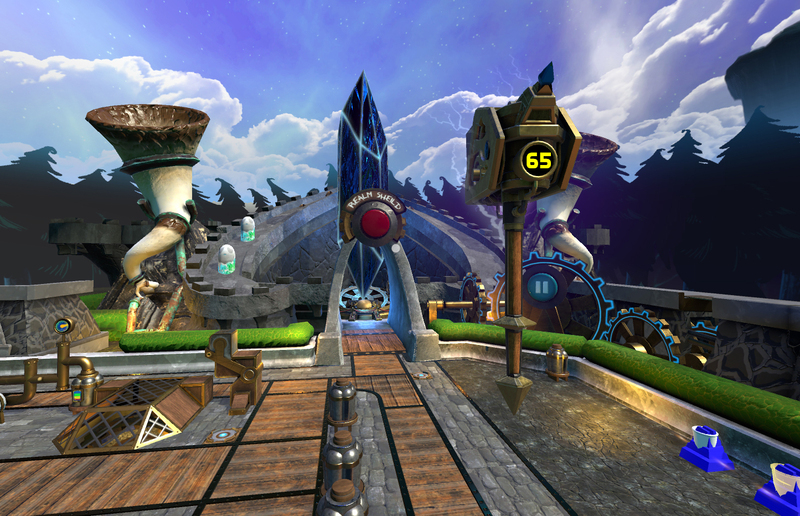 Playing through the game, the player will acquire Wisps, which are used to build and upgrade turrets. Turrets are built instantaneously when selected, but they cannot be built once a round has started.